I’d been making them for years but it was after a visit to their homeland I realized I’d been doing everything wrong. 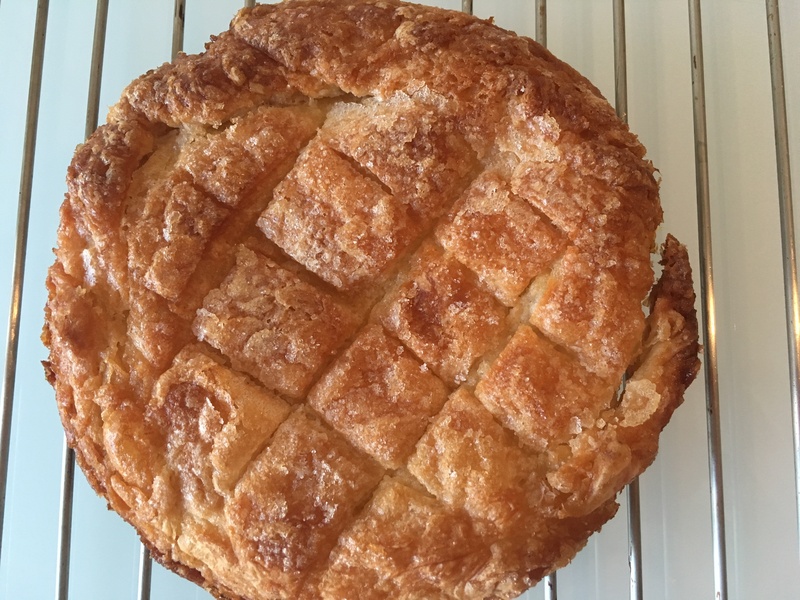 Kouign Amann, a traditional Breton pastry, turns out to be much easier to make than I thought. On a trip to Canada this November I was surprised to learn Kouign Amann was having a moment. It’s one of my two favourite French pastries (brioche feuilletée is the other) but this was the first time I had ever seen it in North America. Even in France, this delicious and deadly treat (just look at one and your hips start to grow) is pretty much confined to its native Brittany. Then curiously, last month, in British Colombia and then in Ontario, I found it in almost every bakery I visited. (Apparently it has also risen to fame in Japan and the US.) This was ironic because my trip to Canada came right on the heels of a first visit to Brittany where I sampled the real deal, Kouign Amann in situ. Before Brittany the only place I’d eaten Kouign Amann was my kitchen. I discovered this fascinating pastry over twenty years ago. I was intrigued by the strange name (it means “cake of butter” in Breton and this is how to pronounce it) and immediately hunted down a recipe. Like most modern incarnations, the one I found was based on croissant dough. The idea was to laminate the dough not just with butter but also with sugar. As it baked in a hot oven the butter-sugar combo morphed into a delicious, gooey caramel which oozed seductively out of the hot pastry. Love at first bite. The Kouign Amann I saw in Canada reminded me of those sophisticated pastries I had taught myself to make. It had taken some doing but I eventually mastered the croissant dough and they often turned up on the breakfast table in the early days of Petraia, before we got our honey bees and I outlawed sugar in my kitchen. So when I finally got around to visiting their homeland this past November I was astonished to find I understood everything wrong. In Brittany I found a different pastry altogether, a rustic treat with humble pedigree that tasted better, much better, than anything I’d ever made. And to add insult to injury they were also much easier to produce! As usual, to really understand a beloved traditional food it can be enlightening to make the pilgrimage to its homeland. Kouign Amann is a pastry that traditionally was made quickly and easily in Breton farmhouses on baking days or on Sundays as a special treat using scraps of leftover bread dough and the delicious demi-sel butter for which the region is famous. Today the pastry appears to be mostly produced in bakeries, but the concept is the same. Bread dough is rolled out thin, slathered with a decadent amount of that insanely good soft cultured butter and sprinkled with sugar. The buttered dough is folded into an envelope shape and then rolled out before it is baked in a hot oven. It’s that simple. Sometimes the mix might contain some blé noir, Brittany’s stone ground buckwheat flour, but mostly it is made from wheat flour. If you make your own bread or pizza dough and understand what a puff pastry “turn” is then the simple recipe below and the best butter you can afford is all you need to make an outstanding treat. If not then try purchasing some bread or pizza dough from your local baker or supermarket and tune into this Breton video at the 5:45 mark (its in French but don’t worry) to watch a Breton baker laminate and roll out his Kouign Amann. It has taken me ages to decide whether to post this recipe because for years now I have been sugar-free. This blog and my work as a chef at Petraia where we kept our own honey bees always celebrated the use of honey instead of sugar. But for Kouign Amann, I decided to make an exception in an effort to better understand a beautiful Breton tradition. So be careful with the finished product...it doesn't come with a warning from the Surgeon General but it should. Line an 8 inch pie plate or cake pan with parchment. Roll the dough into a circle 6 to 8 inches in diameter. Spread the butter over the dough in an even layer leaving a half inch border around the edges. Sprinkle the sugar over the butter. Fold the dough over the butter to make a rectangular envelope shape. Give the dough three simple turns or, one simple and one double turn. Roll the dough out into a 6 to 8 inch circle, sprinkle with the extra sugar. If you wish, use a knife to cut a checkerboard pattern into the top of the dough. Transfer to the parchment-lined baking dish and bake for 30 minutes or until golden brown. 1. Use sugar spiced with cinnamon or pumpkin pie spice. 2. Grate chocolate or sift cocoa over the sugar when you sprinkle it on. 3. For a salted caramel pastry, add fleur de sel to the sugar (Brittany is home to the famous Guernarde salt flats). 4. Scatter raisins, coconut, sliced almonds, sesame seeds or other dried fruit or nuts over the sugar. 5. Brittany is also famous for apples. Try a layer of thinly sliced apples or pears over the sugar. Adapted from Forward to the 5:45 mark in this video to see how to fold the dough and execute the turns.. Its in French but don't worry! P.S. Happy New Year everyone and thanks so much for reading me here and following me on Instagram. I’m sorry my blog posts in 2016 were so few. It was a year of transition after the move from Petraia and I hope to do better this year. Thank you for hanging in on the journey and I truly hope 2017 is wonderful for all of you.